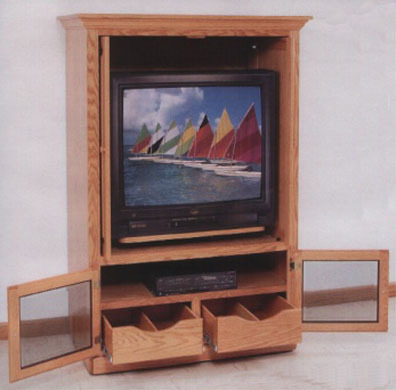 Our Amish crafted deluxe entertainment center is the perfect choice for someone who needs a basic entertainment unit to start with, and has some expansion capability down the road. Made by the Amish in your choice of solid oak or cherry wood, it features a pair of raised panel pocket doors, designed to move back into the cabinet when not needed, a convenient swivel platform for the TV, a couple of drawers with handy tape dividers and the equipment space are covered by a pair of doors sporting beveled smoke-tint glass. This entertainment center will look great in your living room, family room or den, and we can also supply a variety of matching bookshelves and bookcases to go with it.